Looking through the Improve Photography facebook fan page, the most common question is how to pose people for group portraits. I think the reason that many of the members of our community are nervous about this taking this type of photo. 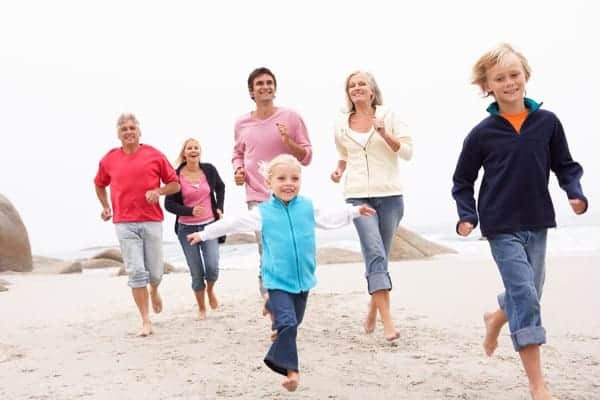 Fortunately, group portrait photography of a family or other group is not overly difficult as long as you know a few steps to take in order to get a great photo. The rows of heads in this photo don't look too bad, but breaking up the pattern would make them feel more like a tight group. This posing tip is first for a reason. It is probably the easiest way to dramatically improve your compositions for group photography. The idea is that you get the people to be on all different levels so that any pattern of heights does not distract the viewer from seeing the group as being one cohesive unit. 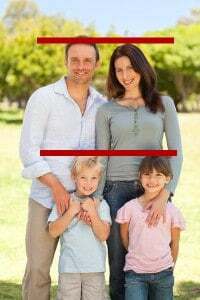 In the photo at the right, you can see that the parents are roughly equal in height, and the children are equal in height. Standing this way would be fine for a snapshot, but it does not look like professional posing. Changing this pose up just slightly could make a big impact in the overall photo. Pretty simple, but it can ruin even the best poses if someone's face is covered. Trust me, it will be the first thing that your client or your family notices even if the rest of the picture is perfect. Just remember to scan the entire group before taking the photo to make sure that everyone can clearly see the camera. Some photographers say “If you can't see the camera, I can't see you.” This might help for larger groups, but it makes people think that they are completely uncovered if their eyes can see the camera, so it's best for the photographer to take control and check before each shot. Formal group photos are tough to pose because people will not remain still. Even shifting their weight from one foot to another can completely change the pose. Posing a group of five or more can be like playing Whack-a-mole. As soon as you get one in place, another one moves and you have to get the other one set! If the group is willing to try something different, you could completely throw the formal group photo out the window and just have fun. Here are a couple ideas for doing casual group photos: (1) have the group run toward the camera, or (2) put the group casually lounging on the couch and the floor like a family would sprawl out for movie night in the family room. Posing this group on uneven footing makes the composition feel natural and there are no distracting patterns of even heads. One of the best ways to get the subjects heads on different levels is to find a location that will allow for it. For example, you could pose the family or group on a staircase so they are all sitting on different steps. This will easily break up any patterns of head levels so the group looks like one and no pattern distracts the viewer. You could do the same thing by placing the group on fallen down logs or on boulders or any other uneven surface. Tip #5: Rip that shutter! As you look through your photos in Lightroom after a shoot, you sift through until you find the perfect photo. Then, you notice that one of the people was not looking at the camera. So frustrating! When I shoot group photos, I always put the camera on “continuous low” so I shoot 3 frames per second. I grab three frames of each shot I want to take. It is more time consuming and it can be a pain to edit, but this allows you to mask together multiple shots to fix the one person who is not looking at the camera or is covered up. Lighting groups can be tricky if it is your first time. There are basically two mistakes that most “first timers” commonly make. First, they use only one light for a group. This will make the one person who is close to the light overly bright, and the people on the other side of the frame will be mostly untouched by the light. The second common mistake is placing the lights too close to the axis of the people, so one person's head throws a shadow on the next person. When shooting group photos, I usually pull the lights in much closer to the camera than I typically do when shooting one or two people. I think I see what the photographer is going for here, but the group is so far spread apart that it feels unnatural. Most people have a natural bubble. 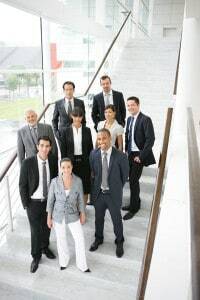 When you ask a group to stand together for a picture, particularly if it is a business group rather than a family, the group will be spread much further apart than they should. If you take the shot with the group too far apart, they will not feel like a group at all! If you find yourself constantly saying, “Can you all squish in a bit tighter?” then you're probably on the right track. If you shoot group photos for profit, you must absolutely dominate the situation. When there are a lot of people getting together, it will be chaotic and will take twice as long as it should if you don't step in and take control of the situation. They will not know where to go unless you tell them. These things don't pose themselves…. 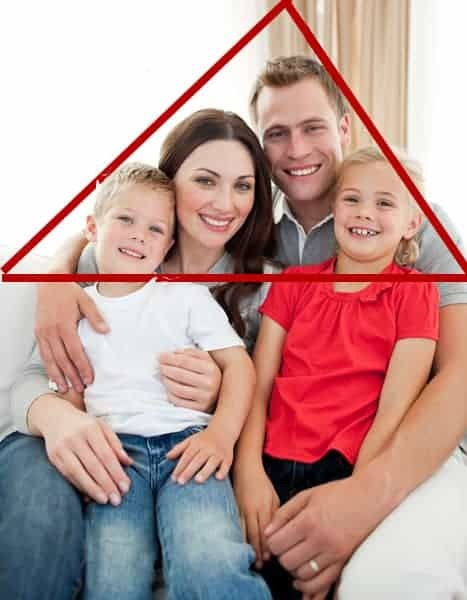 This triangle works perfectly as a composition element for this family photo. Triangles are an underused tool of composition, and yet it is probably the most important rule of composition for shooting group photos. It will be unlikely that you could successfully shoot a group photo following the rule of thirds. Wouldn't it look strange to have the family squished off into the corner of the photo and then a giant space of nothingness in the rest of the shot? Yes, it would. So the best way to compose group photos is to use triangles to your advantage. Have the group positioned so the bottom of the people is wider and have only one person at the top of the pose. This makes the group look like a single unit and the composition looks complete. It's insanity! Save the children! Someone stop the photographer from scarring the children for life! It might seem like a good idea, but seriously… don't do anything embarrassing like in the photo on the left. Group photos can get awkward fast if you aren't careful. If you are ever tempted to do posing like in the photo to the left, just give me a call on my cell phone. My number is [redacted because 4 or 5 people ACTUALLY CALLED in the last few months–this was intended to be a joke]. Just don't do anything crazy before I talk with you. P.S. If you haven't LIKED Improve Photography on Facebook, you're missing out on half the fun! It's the perfect place to ask photography questions or to get group therapy for when you're considering an awkward pose!